Every major TV event has its own drink and snack combo. For the Superbowl, it's wings and beer and everything imaginable that can be shaped like footballs. For the Superbowl halftime show, it's more beer and some chips and dip. For the ads during the Superbowl, it's a few more flavors of chips from the supplementary chip cabinet in the kitchen. And for some, for the presidential debate, it's a buffet of alcoholic drinks perched on the coffee table in front of the couch. Depending on your drink of choice, it could be a fancy cocktail, a glass of wine, or a can of light beer, but the one indisputable fact remains: many viewers said they needed a drink after Monday night's debate. If you are one of the estimated 100 million people who watched the debate, you may find yourself in need of alcoholic reassurance that democracy will triumph on Nov. 8. Should you count yourself among these viewers, rest assured that you are in good company. Numerous Twitter users, including a generous handful of celebrities and even a dictionary or two, grew thirsty after the first few times Donald Trump said "I think I did a good job," or even after the first time he said "law and order." Others warned against the danger of following the rules of such games, suggesting obedient rule-followers could cause serious damage to their bodies. Popular reasons to take a shot or a sip included Trump's beating-a-dead-horse reference to Clinton's email scandal. Trump's tendency to use questionable vocabulary in debate, including "big-league" as an adverb — sometimes misheard as "bigly" — also sparked a few toasts. The question remains: While many drank what we found in our local liquor cabinets, what did the stars drink as we all gathered around the TV to watch the debate for the presidency of the country we all share? I have pooled my resources to make my best educated guesses. The singer, who has been open about her commitment to staying sober, partly as a lifestyle choice for her psoriasis, posted the tweet: "I need a drink." Before her sobriety, Lauper reports that her drink of choice was vodka, so I imagine she would stick to the classics. Bareilles, who also tweeted about debate drinking, seems like a classic champagne person to me — keep it sweet, simple, and bubbly. Perry famously sang about her fondness for the beach in "California Girls," and she tends to favor elaborate costume designs, so it's only fitting that she would opt for a cocktail as she supports the candidate she endorses, Hillary Clinton. For that matter, Demi Lovato will probably join Katy — as two pop stars who have publicly supported Clinton, they can drink and sing about political absurdity all night long. Laverne Cox has endorsed Clinton, and considering Trump's flat-out denial of his own racist and sexist remarks during Monday's debate, she might want a tall glass of wine. 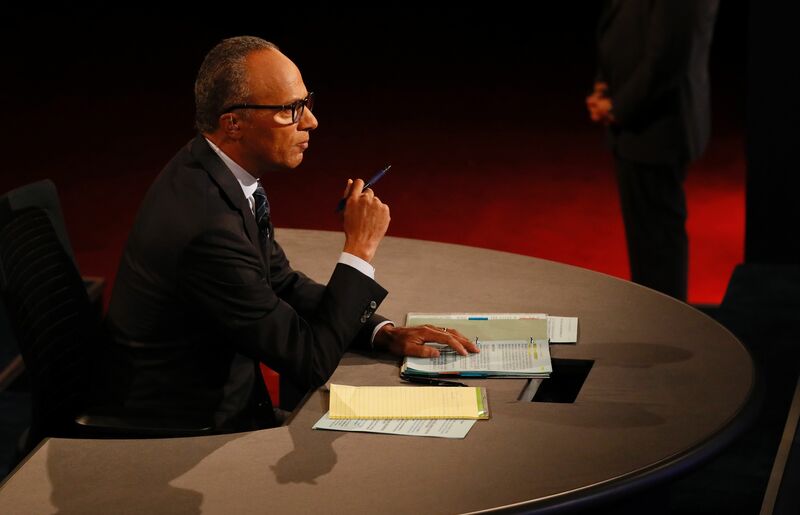 Holt came under fire from multiple sides after Monday's debate, criticized for both his restraint as a moderator and his tendency to fact-check Donald Trump and cite previous quotations from the Republican candidate. Watching that debate might have been tough, but moderating it must have been even tougher. Cheers.